Is Your Child a Potential Identity Theft Victim? Identity thieves are seeking new targets, and your child might be an easy one. 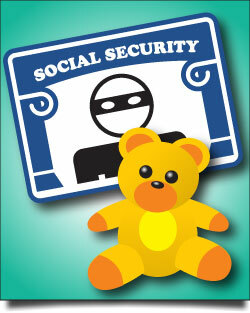 When a child is born, most parents apply for a social security number. Armed with that information or a birth certificate, fraudsters can easily apply for credit accounts, loans and government benefits to name just a few. And, because it will be years until your child applies for credit under his or her own name, the ID theft can go undetected for years. The Federal Trade Commission offers these tips on protecting your child’s identity from being compromised. • Find a safe location for all paper and electronic records that show your child’s personal information. • Don’t share your child’s Social Security number unless you know and trust the other party. • Many school forms require personal and sometimes sensitive information. Ask how your child’s information is collected, used, stored and thrown away. Ask if you can use a different identifier or just the last four digits of your child’s Social Security Number. • Shred all documents that show your child’s personal information. • Be aware of events that put information at risk, for example losing wallet or a break-in or security breach at your home, school or doctor’s office. • Your child begins to receive suspicious mail, like pre-approved credit cards and other financial offers normally sent to adults, in his or her own name. • You try to open a financial account for him or her but find one already exists, or the application is denied because of a poor credit history. • A credit report already exists in his or her name. If the child has one, he or she may have been targeted already, since only an application for credit, a credit account, or a public record starts the compilation of a consumer credit file. If you think your child’s personal information might have been compromised, the first step is to contact each of the nation’s three credit reporting companies. A Fraud Alert can be placed with your child’s credit report. This entry was posted on Thursday, March 12th, 2015 at 4:22 pm and is filed under Data Security and Fraud Prevention. You can follow any responses to this entry through the RSS 2.0 feed. You can leave a response, or trackback from your own site.